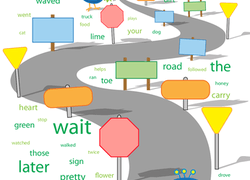 Boost her adverb skills with a new challenge: writing her own sentences using adverbs. After learning about a predator/prey relationship in the wild, students can use these organizers as a pre-writing exercise for informational paragraph writing. Practise choosing between a or an and writing them in sentences in this quick drill worksheet. 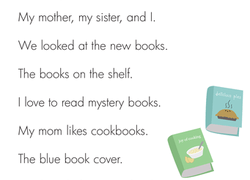 This printable will work detail into her writing. 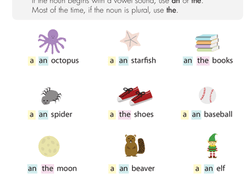 This year four reading and writing worksheet explains when to use the articles "a," "an," and "the" before a noun. Help your first grader learn special plurals like men and geese by having her practise writing their plural forms. Sentence Structure: Sentence or Fragment? This year three reading and writing worksheet about the bookstore has complete sentences and incomplete sentences. Kids underline the complete sentences. On this year three reading and writing worksheet, kids carefully, cheerfully, and maybe even quickly circle the adverbs that modify the underlined verbs. 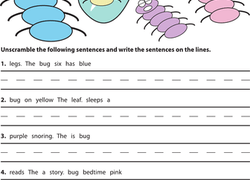 Kids unscramble silly bug sentences, and get writing and sight word practise along the way! Get them in order by writing each one down on a traffic sign. Action words make writing pop! Through this activity, your second graders will practise using action verbs to tell an engaging story about what they did at recess. With this worksheet, your students will enjoy writing a narrative using the reflective pronouns myself, himself, herself, yourself, themselves, and ourselves.